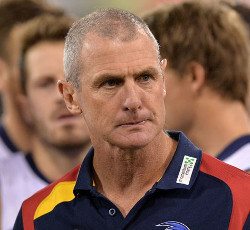 Why has Phil Walsh's son Cy just disappeared from view? It has been almost a month since the coach of the Adelaide AFL team was allegedly stabbed to death by his son Cy but we have heard nothing about the young man's whereabouts since the day of the tragic events, on 7 July. We heard that Cy had been taken into protective custody in a secure ward of a hospital facility somewhere but that's all we know. We have heard nothing about further interviews with the suspect in the crime but it appears clear that Cy was a person living with schizophrenia who finally gave way to the messages he was exposed to in his mind. In the absence of any other information, that's how I read the situation anyway. It's curious how softly the authorities are handling the case of Cy Walsh. Other deranged murder suspects have not been so fortunate. But on the other hand it feels like Cy has simply disappeared into a black hole of authoritative ministration, like someone embraced by a dark cloud of ectoplasm and subsequently hidden from view completely. It's almost unaccountable. It's not as if the public has nothing to compare this case to. Most notably there was the case of the 2009 stabbing of art dealer Nick Waterlow by his son Anthony in Sydney's eastern suburbs. A book on the murders - Nick's daughter Chloe was also killed in the same incident - appeared in 2013. We have plenty of information about this terrible disease and the things it sometimes makes people do. If Cy - and subsequently his father - is another victim of it, then surely the public has a right to know so that we can better deal with the disease. But just dropping the poor man off the side of the universe into the bottom of an administrative gunny sack is not the way it should be done. To me the notoriety gained by people who work as football coaches is somewhat unaccountable, but surely this is an opportunity to raise the profile of a terrible disease that many people in the community live with every day. Not in a bloodthirsty and unthinking way, but in a way that allows us to come to grips with it and so deal with it better. The silence surrounding Cy Walsh is in my mind just another example of the stigma that always still surrounds mental illness, and that prevents people from talking about it openly, which is what we need to be doing in order to better deal with it as a community. Only by facing what it means together can we effectively manage it, and hopefully help to improve the lives of many people who - heroically and unseen - live permanently with mental illness. As news comes in the Adam Goodes is thinking about retiring sooner rather than later, it's time I think to consider what spectator sports are doing to us as a society. I know some of my friends will have different ideas than me, but I have to say my piece. This issue was brought home to me strongly this week when I saw the ABC program on Don Bradman, and heard his son talk about changing his name to escape the pressure put on him personally by fans of his father, and his granddaughter talk about her own psychological struggles which manifested in various ways. The pressure to perform places on athletes, and the pressures put on those who are close to athletes, are something almost unconscionable, or at least something that can easily be regretted by a reasonable person. Personally, it's easy for me to say these things because it's always been difficult for me to be a joiner. By nature I'm an individualist, and I always have been. This came back to me a couple of years ago when I was writing a poem about my romantic involvements. I found that I was having to talk about someone who prefers to be alone. Solitude has always been like a second nature to me, and any diversion from it has seemed like a cheat. 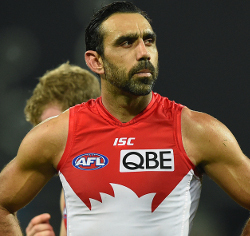 The debate surrounding Adam Goodes makes me think about spectator sport and what it means. Almost like a religion, spectator sport creates community, which is something that people mostly like. In fact even loners like to feel they belong, although they may not always admit it easily. What we look for is some sort of community, even if it is the community of rejection. By rejecting the mainstream we are not rejecting community itself, but rather we are asking others to take our conditions into account. We are discerning. We are something like an elite. Like elite athletes, we are personally accountable for our actions, but when it comes to sport it becomes harder and harder - the further up the tree you go - to match the demands of the discipline with the spectacle most people are comfortable with. They are two different things. We don't need them as much as they need us. Or vice versa. This is the side of a 95-gram can of Sirena tuna that I bought this week and it says that the tuna is 73.5 percent pole-and-line caught. The can underneath this can is a 185-gram can of Sirena tuna I have had for a fairly long time but it says nothing about the method of fishing. The reason why it doesn't say anything about the fishing method is the same reason Sirena used to come last in Greenpeace's canned tuna ranking system, because it was once caught in industrial-sized fishing nets using fish aggregating devices (FADs), which are both ways designed to maximise bycatch (the capture of animals other than mature tuna, such as for example dolphins and turtles). I used to write stories for magazines, and I did two stories back in 2010 on tuna fishing. One of them, for the National Times (a now-defunct Fairfax publication) is linked here and is titled 'Can shoppers save the tuna'? It seems some people were listening, not unimportantly the folks at Sirena, because pole-and-line fishing was a fishing method I discussed in the story as a sustainable way to catch this particular type of fish. Tuna is rare and getting rarer. It's a great feeling to know you have been part of something big that has made the world better. Hopefully all other food companies around the world who sell canned tuna can also get on-board and mandate better ways of staying in business. We certainly don't want to run out of fish, although the way things are going it's a very real possibility that wild fish will become unavailable in the not-so-distant future. I talk about these things in the story if you're interested. This is a shot from a video I made this morning on my iPhone when I was up at the nursing home seeing mum. 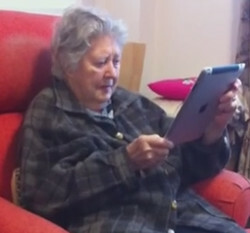 The odd thing about this video, which shows mum talking with her eldest son on her iPad, is that there is no sound in it. My brother was chatting away about planets and space travel and mum was working hard to keep up with him - she brightened up perceptibly when his cat came into the picture, which tells you a lot about the priorities of old people - and I was sitting on the bed taking the video on the iPhone. When it finished with about five-and-a-half minutes of footage captured, the funny thing is that the camera screen just froze. What I did then was to assume that something had gone wrong, and I rebooted the iPhone. What had been happening however was that during the period when the screen seemed to be frozen the iPhone was actually processing the video and saving it, and I had interrupted this process by rebooting the device. I know this because I successfully made a second video on the iPhone while talking with mum in her room - a video of about three-and-a-half minutes' length - and I was able to see that one in the camera roll immediately. By the time I had driven home the first video had appeared in the camera roll, but after uploading it to YouTube I found that it had no sound. So I have a 5-minute video of mum talking to my brother on the iPad but with no sound. Sad. That's not the only video niggle, however. To sort out the second video niggle, I just now successfully made a broadcast using Periscope. But when I had tried to do the same thing while I was sitting in mum's room in the nursing home Periscope refused to work. The 'Broadcast now' button would not appear and after the program tried to initialise it would just drop out back to the regular iPhone home screen. I guess that the problem in this case was the bandwidth. I do remember checking the phone's signal strength and remarking to myself silently that it looked ok, but it must have been too weak for the broadcast to go ahead, and Periscope had just given up when the required signal strength failed to come through in the program. A couple of weeks ago Microsoft asked me to change my PC login from the simple one-password login I had used for years - since I bought the new PC in 2013, that is - to a new login that I had actually set up some time before, when Microsoft bought Skype, one that involves an email address and a password. It was a bit annoying. I didn't really mind because I had made a record of the new login that I could bring to hand when I suddenly needed to use it. I didn't even make much of a fuss - apart from this blogpost - when Microsoft asked me if I wanted to back up all my files in the cloud. (Answer: a definitive NO!) But now other things have started to happen on my PC I didn't expect. Yesterday as I was using the PC normally - for social media mainly, although I did do a blogpost as well - Facebook started to hang. I clicked out of Chrome to Outlook (which is always open), and found that this application, too, had started to hang. So I started clicking around between Chrome and Outlook to see where the problem might be, or to find a reason why these things had started to hang. I couldn't find anything but then I decided to reboot the modem in case the broadband system had fallen out for some reason. When I got back to the computer it was clear however that things were going really wrong. Not only was Chrome whited-out (where the application goes white in the window because it cannot function any more) but so was Outlook. 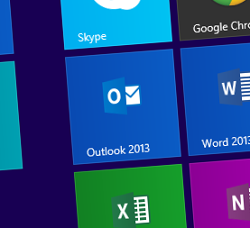 Also, Outlook's layout had changed to something I had not seem before. In the past, one of the menus was always visible along the top of the application window, but now it wasn't. I could only see the 'File' menu highlighted but no menu command icons showing. Normally I keep the 'Send/receive' menu icons showing because to check my email I need that 'Send-receive' icon to be visible all the time. It wasn't there anymore. Because nothing was working at all now I rebooted the computer and brought Chrome and Outlook back up after logging on for the second time that day. I saw that Outlook had changed permanently. Although I had thought that the new menu configuration was part of the glitch that had brought my PC to a standstill, it turned out that the new configuration was the new normal. What had happened of course was that Microsoft had entered my computer and done an update to Outlook without telling me. That's why the computer hung. And the application that I was running now on my desktop was not the same application that I had bought in the box back in 2013 when I had bought the new PC on the Coast. So Microsoft ad decided to update my software remotely without telling me it was going to do so. I'm not sure how I feel about this, but I am very certain that I feel they should warn people before they take over their PCs and cause all their running applications to freeze. 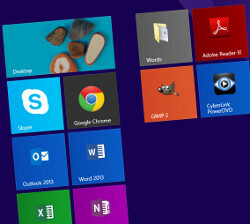 I hope in future Microsoft will let people know when they are about to do this kind of thing. The main outcome of this little exercise by Microsoft might have been to make me learn to use the F9 key to do a "send/receive". Because the default menu in Outlook is now the 'File' menu - which has nothing in it along the top of the application, when selected - it might now have saved me time to use the shortcut key instead of first bringing up the 'Send-receive' menu and clicking on 'Send/receive'. If you leave the 'Send/receive' menu visible, in any case, the associated menu items inconveniently overlap the top email message in the feed, which of course you do not want. Also, once you bring up the 'Send/receive' menu and do a "send/receive" you can't just click back to Chrome, but instead a click out of the application closes the 'Send/receive' menu first, so you need two clicks to click back to Chrome. However, there's still a lifesaving, small 'Send/receive' icon at the top of the window on the control bar which you can use. Thank goodness for that. (I almost didn't see it.) It's a bit small, though. I prefer a large icon to click on. Less margin for error. [UPDATE 29 July 2015]: The same thing happened again, today. Again! In another event, I had earlier in the day contacted Microsoft help desk about a different matter and had asked them if they had remotely accessed my computer to update Outlook, and they said "No". However they did say that my version of Outlook was the latest version, and was different from the version I had installed in 2013 when I had originally purchased the PC. [UPDATE 30 July 2015]: A technician came to look at the computer today and found that I had inadvertently changed the Outlook display options, probably while clicking around when the software froze. He checked for why the computer had behaved the way it had but could find nothing specific, but deleted some unnecessary functions running in the background. In the past week or so Twitter made the switch and removed people's profile background images. People often used very personal and carefully designed images as the background of their Twitter profiles but that choice has now been removed by the company. Twitter homepages now all share the same bland, corporate design. Some people might resent this change, or at least I have heard that some people do, but on my part I find it hard to work up much outrage for something that is in reality so minor in the wider scheme of things. This despite the fact that I was quite proud of my profile background image - which you can see here. It was taken from an old five-and-a-half inch floppy disk that had survived from the days of the blue screen of death - I bought my first PC in around 1987 - and that I had for some reason retained in my archives. When I say "survived" I mean that there had been several changes of address, including a change of country, after I had relocated the family to Japan in 1992. When it came to choosing an image for my Twitter profile in 2009 or thereabouts it seemed an easy choice for me to use this image. The image, which was originally made using one of those clumsy "paint" programs in the days of 64-bit colour, showed a drawing I made in the program of my own hand, but where it had been modified to look like a face. 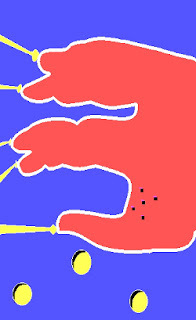 At the ends of the fingers there are rays coming out, like lasers. There are also some bullet-like holes to complete the fighting ensemble. When Twitter appeared the image seemed quite prescient, so I deployed it on my profile. Noone made any remarks about it in all those years of it being there. So there you go! Earlier this week I organised to go and meet a friend who works in Randwick and so this morning I got in a cab and went out to the Eastern Suburbs to meet him. In his office we had coffee and talked for an hour-and-a-half or so then I left him at his office front door, turning up Albion Street which takes you to Bondi Junction. In the mall I stopped at a Japanese ramen restaurant and ordered a large bowl of tantanmen which I ate at a steel table situated on the footpath. After lunch I walked south down Oxford Street and crossed over the bypass at Nelson Street, Woollahra. I stopped off briefly at a pub in Woollahra to attend to nature but then continued up Queen Street to Oxford Street and then turned west, heading toward the city. I walked all the way down to Hyde Park and then crossed Elizabeth Street into Bathurst Street, heading down the hill toward Darling Harbour. At the footbridge I crossed over the expressway. Then I turned north and came up under the Pyrmont Bridge, and home. The photo shows Paddington Town Hall and, if you look down the corridor of Oxford Street into the grey distance, you can just see on the horizon the square-block tower of the University of Technology, Sydney. I thought the contrast between the two buildings - separated as they are by about 100 years of history - was suggestive of the vintage of the city of Sydney. As you can see there were quite a lot of clouds today. I took an umbrella with me this morning because it was raining when I left home, but it soon cleared up and didn't rain for most of the rest of the day. After yesterday's trip to the southern end of Newtown to visit the second-hand shops, today I decided to take advantage of clear skies to walk up to Newtown again to buy coffee. A good friend of mine had some time ago recommended Campos Coffee for my regular supplies and so usually I buy from them through their internet site, with the coffee delivered in the post, but today I went up on foot at about 10am through Wentworth Park and alongside Victoria Park to get some more. On the way I saw this ceramic dog in a shop window in the north part of Newtown, near the university, and on the way home I snapped a photo of it. It's designed to look like a plastic inflatable dog but it's actually made of clay and fired in an oven and painted. I thought it was a cute addition to postmodernism, following in the steps of American Jeff Koons who made an imperishable dog designed to look like a balloon dog, but which was made out of steel, the first of which in 1994. In the street this morning the weather was fine when I left home but after my haircut in Broadway it had clouded over again. There were mothers with children playing in the kids' play area in Victoria Park near City Road when I was walking back north but by the time I reached the Fish Markets it had started to spit rain gently. I had a good walk though and did some important errands by the time I came back home, at which time I unpacked my purchases - including fish and onions, and the bag of coffee, as well as sketch pads - and then had a nap for a few hours in my room. A friend wanted to buy a retro standard lamp today so I walked to Glebe to have brunch in a well-known cafe and then together we made our way on foot to Newtown, going past the turn-off to Enmore Road and around the corner toward St Peters to where there are a number of second-hand shops. This sign was plastered to a sheet-steel municipal garbage bin set at a slight angle on the footpath, due to some sudden impact no doubt. I had some trouble working out what it means and I have to say that the meaning still eludes me, so if anyone knows then please let me know. The bin turned out to be a bit on-the-nose, by the way, so I found myself moving up the footpath some way to escape its noxious odor. The bin is situated right outside one of the second-hand stores located in this part of Newtown. It has to be said that there are no second-hand stores located to the north of this sign, so from this fact I can assume - not without reason, I think - that the days of the second-hand store in Newtown are probably numbered. Nevertheless, we did find a suitable candidate for inclusion in my friend's apartment, so when we caught a cab at the kerb near the Dendy Cinema it was with our hands full. They remain largely unaltered from one meeting to the next, from day to day and from month to month. I was reminded of this truth today when I went up to the nursing home to visit mum. When I arrived she was in bed having a snooze but she got up quickly when I told her I had brought chocolate for her. I put the chocolate next to her sink as she lifted herself from a prone position to a sitting position. Then I called my brother on the iPad and she talked with her other child for half an hour or so while I went down to the nurse's station to arrange a few things. We went then to the park for a walk but the cold weather had returned with the clouds even though it had promised to be warm this morning, with sun. Not much chance of that, it seemed, so we stayed in the park for about five minutes before going back inside. I made my way ahead of mum to her room and stood in the room waiting for her to appear. When she didn't arrive I backtracked and found her sitting on her walker in H's room. Despite some friction in their relationship from last time it seems they are still as thick as thieves. I told her I would go back to her room to wait and she waved me goodbye. In her room I checked my phone for 15 minutes or so until lunchtime came around, then went back to H's room to pick up mum to take her to the dining room with me. H was bossing her round as usual, this time making her take clothes out of the cupboard to show H as she sat in her chair. (I have mentioned before how disabled H is in terms of mobility.) H wanted a different jacket to wear to the dining room that would go with her red shirt, and she was asking mum to get different items of clothing out of the cupboard to show her so she could make her decision about which one to wear. When I arrived she turned to me and asked me if a particular jacket in the cupboard was red, and I said no, it was fuchsia. But H wanted it so I took it out of the cupboard and gave it to mum. But mum had both hands resting on the bed in front of her. I asked her if she was ok, and she said, "I feel a bit faint," so she toddled off to the chair on the other side of the room, taking the fuchsia jacket with her. Then H asked her to hang up another jacket that she, H, was holding in her lap. "I'll do it," I said, worried that mum had taken a turn because of all the orders from H and had become overwhelmed. Then mum and I left to go to the dining room. On the way there I came across a nurse coming the other way. "She's ready," I said, smiling. The nurse was smiling too. "I don't need to tell you who," I said. "No," she said as she went past me. H made it to the table at last and sat down amid a cloud of orders aimed at the nurse helping her. "You have to pull out the chair, I'm not strong enough." "Can you pull out the chair?" "I want to go there, tell her to move." At last she was seated and then within 10 minutes - during which time we sat around the table chatting - she was complaining about how long it was taking the food to arrive. "I'm hungry, where's the nosh?" "Are they bringing our food?" Meanwhile mum, who was clearly exhausted, would close her eyes and drop off into a little sleep from time to time. It went on like that for a little while and then the food arrived and we all ate. What a diversity of umbrellas! And then some people who were out in the rain today had no umbrellas. Hunched and unhappy-looking they trudged along in the winter rain. I had my black umbrella but there were umbrellas of many colours out and about this morning as I walked right across town and right back home for an appointment. For me it was an hour-and-a-half in the wet but for office workers I think there will be quite a few wet shoes under many a dry desk today. I was able to get home and change out of my wet trousers and socks. The shoes I wore today are new ones and they kept my feet relatively dry but after that amount of time splashing along sodden streets there is sure to be a degree of seepage, so it was with relief that I cancelled another appointment this morning I was to go to by car and removed the wet clothes and put them in the washing basket ready to be washed. How comfortable with tingling legs and feet to sit down with a cup of leftover coffee. How hard it must be for those sleeping rough in this weather. At the top of Martin Place on the left side as you ascend the hill there is a building with a large sheltered area where rough sleepers congregate but this morning I counted only one; usually there are more. Just one pile of blankets with someone asleep under them, the many layers of wool and polyester forming a barrier keeping the body underneath dry and warm despite the cold, hard pavement below. This weather has frightened most of the rough sleepers off, it would seem. I splashed through the puddles opposite the Reserve Bank where the fountains sit and headed down to Castlereagh Street holding my umbrella against the steady downpour. Spare a thought also for deliverymen today. The women with their scarves wrapped up around their lower faces protecting their lipsticked mouths from the rain and wind might have warm, dry offices to go to in this weather but not everyone works inside. For me, I think I will heat up some sauce from two days ago instead of going out to get food for lunch. I can cook a handful of pasta to go with the sauce. If I remember correctly this sauce was made with capsicum, onion, mushroom and lamb chops. That sounds like a good thing to eat on a rainy winter's day like today. I think a lot of people are wondering why Alexis Tsipras accepted a deal from Europe every bit as bad as the one the Greek people shortly before had rejected in a referendum. At least there seemed to have been a fair amount of celebrating by people on the left generally when the poll result came in. But then this deal appears, in which Greece gets some reprieve in the form of cash and in return agrees to some reforms designed to make the economy more competitive, and to prolong the austerity. It's a bit of a puzzle, but then again there are a lot of things that are clear only dimly, in partial view, in this long discussion between Greece and its creditors to the north. One of those things is why the Greeks seem to want to remain part of Europe even though they voted for less austerity. Do they think that Europe is simply going to buckle, and give them more money with no conditions attached? There is a kind of illogic involved in the whole thing, and it might be because the Greeks accept that they need reforms but they still do not want to pay any tax. Which is not really surprising. It would be an unusual person who would openly go on TV to say he or she had done everything possible to avoid paying tax, and that they had been successful for most of their lives. 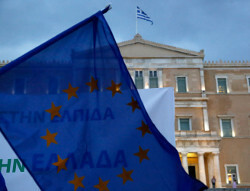 Shame stops them, but by the same token pride makes the Greeks yearn to continue to remain within the Euro. As for Tsipras, the poor man! Jerked from one side to the other on a short leash, trying to meet the expectations of an unruly electorate on the one hand and the equally pressing ones of a stubborn set of creditors on the other. I honestly feel sorry for him. Surely he could not have known, when he stood for office, that the job would be this hard. Through him are focused all the intensity of the will of the European creditors, aimed ultimately at getting the Greek people to change their behaviour - and pay their taxes - and the difficulty of managing all that energy, and making that unruly mass move in the right direction, is taking its toll on him. If we have learned anything from recent events it is that nothing will happen quickly. Europe will not budge in its effort to get the Greek people to change their behaviour. Equally, each Greek will do everything possible to minimise the cost to him or her personally. Time will tell who wins. In the meantime, Australian superannuation funds slide up and down in value as the local stock exchange illogically responds to events in Europe, affecting us all. The GFC is somewhat like a zombie, it never seems to die. It looked so incongruous. On springy flanks the greyhound ambled up the street next to its master, a man in a dark suit and wearing a dark woolen overcoat. Next to the man walked in tandem a woman with blonde hair who was dressed for the office. Both of the middle-aged people looked like office workers and would not have looked out of place in any building in the CBD, in fact, except for the presence of the black and white, long-nosed hound walking alongside the man. It just looked wild and out-of-place, the greyhound. The way they walk, dogs of this breed, with two feet touching the ground only at any time, like a coil springing past in tiny, polite bounces. Like a tumbleweed. Like a stone skipping across the surface of the bay when thrown by someone standing on the shore. Just not the sort of thing you are likely to see in the city at morning rush hour. On a beach, absolutely. This greyhound looked well cared-for but greyhounds in the main have unstable lives at the best of times. Kept well if they race and win, they are quickly culled if they do not, and often are abandoned or put down, or both. There's someone I follow on Twitter who often publishes details in the feed about greyhounds seeking homes to live in. They look so sad, these homeless dogs with their long, pointed faces. The greyhound I saw yesterday in the city had its ears held close to its head, as if it were being cautious or had been warned to behave. I wondered what it could have felt, surrounded as it was by thousands of people and hundreds of cars crawling through the traffic. Out of the street I turned into a building and took some stairs down to the basement, where the dusty, acrid smells of cars in traffic were replaced by the sweet aromas of coffee and scented soap. I could suddenly hear people talking down here in the depths. It would have been an entirely different olfactory and auditory world for a greyhound making its way through the city, but the greyhound was not there any more. 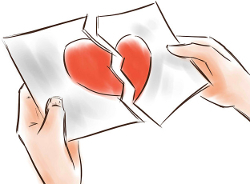 We had gone our separate ways. Yesterday in the post box there was another piece of mail from the City of Sydney. I've been getting used to these offerings from that particular quarter. One of them was a broadside aimed squarely at the Westconnex road project, and now this, a geremiad against the proposed state government amalgamation of the council with Woollahra, Waverley, Randwick, and Botany Bay. Not hard to guess which way the boffins in George Street want us to decide in this particular stoush involving both Town Hall and Macquarie Street. The thing is that bigger councils are always going to be better. I wish that people in Sydney - with its overexploited road network and overused rail network - could see how little traffic there is in Brisbane, and how under-utilised their rail system is. Brisbane has the largest municipal council in the southern hemisphere and two things they do have are lots of money and the power to approve large projects - things which all municipal councils in the greater Sydney area notably lack. Just drive north from Southbank - the entertainment precinct across the river from the Brisbane CBD - over the lovely Go Between Bridge to see what you can do with a few million dollars and the requisite planning power. Or drive further, along the fabulous Airport Link tunnel that takes you all the way from the city to the airport in relative comfort in your own car. Or turn into the Clem7 tunnel that bypasses most of the inner suburban sprawl and delivers you close to the Bruce Highway to the north of the city. Compare those trips with getting across the Harbour Bridge or down Southern Cross Drive, at any hour of the day. And the Brisbane City Council just this year opened Legacy Way linking the west of the city to the Inner City Bypass. In Sydney this scale of development is only being undertaken by the state government. But is there broad support for anything like this in Sydney? The nimbys will out whenever you try to change things to suit the majority. Ignorant people with their own small, vested interests who are too afraid of competing on a larger stage and who just want things to cruise along the way they always have done - forever. Anyway a bigger City of Sydney makes perfect sense to me. If you want to find out how, go and live in Brisbane for a few years. You'll be pleasantly surprised. In Ikea the other day helping a friend buy a sofa bed I decided to download the Ikea Store app. You'd think that Ikea would be the perfect place for an app. All the products have unique identifiers - in their cute little product names - for a start. Then there's the scarcity of floor staff to help out when deciding which product to choose. And finally there's the picking process where you go into the warehouse at the end of the shopping to collect your boxed items. With all of these characteristics Ikea would seem to be the place to really benefit from a good, usable app on a smartphone. Especially in helping calculate a final purchase amount and also in logging the location of the boxed items in the warehouse. You can definitely do with help in these areas. So I downloaded the Ikea Store app while we were in the store. The first thing I noticed however is that product definition is not always so clear-cut. For the sofa bed, for example, you can choose different mattresses and different covers. While the choice of covers is provided for in the app the choice of mattresses is not, so the catalog prices available to view near the product stand were different from the price the app was showing. But even without that little glitch - because it is most certainly an oversight by developers - there is the matter of identifying correctly the right product inside the app. My suggestion is to use QR codes that you can just snap with your smartphone camera off the sign above the product in the floor display. The other way to do it would be to include clear and concise product numbers on the display that could be used to find the product inside the app. These kinds of methods would allow no ambiguity, whereas currently you just go into the category and select the individual product by name. I did find the correct product eventually, even though I stopped using the app as soon as it became clear that there was a problem with it. It would have been a bit easier - though not staggeringly easier - to use the phone to locate the boxes in the picking area instead of the regular piece of paper with information pencilled in on it. Never mind. However I also want to go back a few steps to take issue with the developers of the app because enabling location data on my phone is something that I will never do. The tools they offer to enable you to find a store are therefore difficult, partly because it's a global selection. First you choose the country (!! I know, it's so weird. I have to wonder why they did this since they're going to have to offer different apps depending on the language anyway. ), then you're given a state and territory selector that just doesn't work at all. So you have to scroll through the stores in Australia (not that many) to find the one you want. A better method would be to provide a text box and let people type in the name of the store they are inside; your app's algorithm could then take up the text entry as a prompt and suggest place names to the user to make it easier for them to find the right location. In short, there are a lot of advantages to having an app for a place like Ikea, but the app they have introduced is disappointing. A few improvements in signage in-store as well as a few improvements to the app itself will help the company to produce something usable. I know that these things sometimes take time. I hardly ever go to Ikea in any case, so let them take their time to get it right. All of us have been in that kind of conversation where we feel at a disadvantage, or when we feel that someone is speaking to us from a position of relative power. That's a power gradient they're exploiting, and although there's nothing inherently wrong according to conventional wisdom with exploiting a power gradient in everyday conversations it's unethical to do so. It's also very rude. We find ourselves at the bottom of a power gradient when the subject turns to something that we would prefer to avoid but that the other person takes pleasure in discussing. And power gradients can change with changing circumstances. I once had a work colleague who was reticent and charming when we worked in different units in the organisation, but who became rude and indifferent to my feelings when she became my boss. As I said before, most people would say that this kind of behaviour just goes with the territory: because she had become my boss she was entitled to exploit the new power gradients that arose within the ambit of the relationship. But I find it boorish. Also boorish for me - who has always lived with a foreign-sounding name - is when people ask me where my parents came from. It's because they are exploiting a power gradient - where they, from within the dominant cultural structure, are condescending to me, who presumably owes his existence to a secondary cultural locus. Some people might say it's just curiosity, but the imperceptible slant of the conversation in their favour makes it possible for them to enjoy the effect of power - that pleasurable slide down the gradient - at my expense. I have to work harder than them because I am at a cultural disadvantage according to conventions they are manipulating. People who live most easily within a matrix of power gradients are people who enjoy the advantages of cultural normativism - people who subscribe to the normative culture in the country - as well as economic comfort, and who belong to the ethnic majority. Any conversation during which the relative point of origin of the speakers is known, and where one speaker has an advantage in any one or more of these loci of power, will be influenced by them. There is an ease, like pulling your feet off the pedals and coasting downhill, for the one who has that advantage (or those advantages). That person coasts down the power gradient without exerting any effort because the gradient is doing all the work necessary for them, for forward motion. Some people restrict themselves purely to conversations like this, notably people who never stray far from their native points of cultural reference, or powerful people in an organisation who are surrounded by sycophants and only talk with them. For me, the most attractive thing to see is someone who exploits a passion in order to make the effort required to climb a power gradient seem effortless. It's called charm. There's something charming about seeing or hearing someone who is working hard to counter the effects of a power gradient, when they achieve it without resorting to tired conventions themselves, in effect without being boorish in a passive way, which is a kind of passive aggressive stance. I admire verbal maneuvers that can enable the speaker to achieve his or her goal without resorting to tropes, like mobility aids, that keep you upright but that are unbecoming. 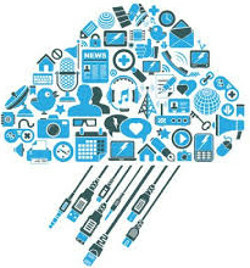 Why would you use the cloud? Of course I immediately said, "No" to this helpful but completely unwanted suggestion. Storing things in the cloud is probably the last thing I would want to do. A friend of mine recently had problems accessing one of her Gmail accounts, and in the past she had lost control of a Hotmail account as well. It's all so uninspiring really. And then there are the stories that appear from time to time, like the hack on Sony, which testify as to just how unreliable the cloud actually is. If people can get access to millions of records that are presumably on secure servers looked after secured by large corporations, how likely is it that Microsoft can keep my data safe? No thanks. People tell you that the future is in the cloud but frankly that gives me absolutely no confidence whatsoever. I'd much rather run my own little empire-in-a-box on the floor next to my desk than relinquish control over my precious data and rely on the security apparatus of a profit-driven entity like a private company. We saw also with the NSA Snowden leaks how governments are so easily able to bully companies into giving them access to our data. Why on earth would Microsoft think I would want them to be looking after my stuff? I can hardly credit their conception of my gullibility. These Christmas trees are real and from what I can work out they were installed on Pitt Street Mall at the beginning of this week and they'll only be there for the rest of the week. There are rows and rows of them organised in a grid in the mall by Westfield as part of its retail promotions but actually it reminds me - for sheer commonsense - of the Cool Yule promotion the City of Sydney is holding in Darling Harbour. There, the council has installed a skating rink as well as a snow-filled play pit for kids (further north under the Pyrmont Bridge). Australia's summer Christmas has always been something of a perverse point of pride - I remember Christmas card designs from my youth showing Santa on a surfboard, for example - but this new concession to the realities of cold weather is also welcome and in my mind it is something to celebrate. It bespeaks a practical nature, and suggests a reasonable response to what can otherwise be a pretty depressing season in Sydney where the wind tends to howl with chilly abandon through the streets, flanked as they mostly are with tall buildings that funnel the air at high velocities. I wonder though whether the shopping centre operator and the city council worked in tandem. Certainly, the council's effort is more substantial - that rink and that play pen have been in operation for weeks already, as far as I can recall - but the corporate operator has also done well to spruce up (pun intended!) the shopping strip with these pines. There's something fresh and crisp about pine trees, which are known to contain a fragrant sap that yields a strong scent. So the rows of pine trees in the mall I think have the effect of a kind of tonic for people who are busy with work or other chores in the city centre. The cherry-red planter boxes furthermore generate a nice Christmasy contrast against the green needles of the pine trees. Cold weather can be pretty miserable. When I lived in Japan for all those years it was a lot colder than it is in winter here, of course. But I didn't like it even though the winter days in Tokyo are mostly sunny and bright. There's not much to celebrate about wintry mornings when you have to pick your way carefully among dirty drifts of snow on the wet pavement. Frankly, as in the case of daylight saving, it makes a lot more sense to have Christmas in summer when you can relax for a few weeks and maybe spend a bit of time in the warm sun on the beach recharging your batteries. I think that's the idea with the Christmas trees in the mall, too: a bit of off-season cheer for tired commuters. There are signs that mum's close ties with another resident are under strain because of questionable behaviour. This resident, mum's neighbour H, has been developing a reliance on my mother to an extent that is becoming difficult for mum to sustain. Mum said something under her breath today when H rebuked her for something mum said. Because they are both a bit hard of hearing this kind of problem is likely common, but I was a little disconcerted frankly. We were having lunch as usual around a table in the dining room when mum said something that H didn't like and H rebuked mum verbally. I didn't hear what it was mum had said but H is like this with people generally, and usually says quite baldly exactly what she thinks. She doesn't masque her feelings, that's for sure. But if it was just this incident I wouldn't worry so much. There have been other things however. I arrived today at the nursing home and because it was a sunny day when I had got into mum's room I suggested that we go to the park to sit on the bench and watch the dog walkers, as we usually do when it's sunny. Mum put on her shoes and I got her hat out of the cupboard. Then she prepared a scarf to wear and fetched her sunglasses out of the drawer next to the bed. We were ready then and we headed out into the hallway. As we passed H's room we could hear her calling, as usual, for a nurse. (She has a habit of calling for the nurse as soon as she notices that there is someone in the hallway, whether it is actually a nurse there or not.) Mum headed into her room and I continued down the hallway toward the dining room, which is between mum's room and the front desk, where I needed to go to sign mum out of the establishment. As mum did not promptly arrive though I turned back and poked my head into H's room to see H giving mum some fairly complex instructions and mum standing there perplexed. Mum and I knew that the instructions were too long for her to keep in mind - H wanted mum to get a nurse to tell her (mum) when H's hairdresser appointment would be that day - or at least I knew that this was too much for mum to cope with at one time. But mum was standing there trying to keep everything in mind while H was telling her bossily what to do. I intervened and told H that mum would not be able to remember all the details she was receiving, and that I would promptly go and get a nurse to go to H and help her. When I got to the front desk I met with a member of the nursing staff and I told her what H had been telling mum. She looked surprised and said, "H had her hair cut yesterday." I said that H was getting mum to do things, and that mum was not really equipped to look after H. "I'll go," the staffer said then, and so I turned away to fill out the leave form and then took mum downstairs so that we could go out to the park. H is a lively and mentally-astute elderly woman and she is aged 93 according to her. She always chooses to sit with mum at the table but from what I saw today it appears that mum is starting to have second thoughts about the friendship. Because mum doesn't remember everything that well it is likely that she will continue to visit H - who has severe mobility problems - and to talk to her at different hours of the day. But I will be talking with the staff next time I find H bossing mum around to make sure that they are aware of the situation as it currently is. I think that these kinds of problems must be reasonably frequent in nursing homes - because the place is, as the name describes, a place where people live their lives, and lives are complex and intricate - but I also think that there must be general coping strategies known by nursing home employees that can be brought into play when such relationships are discovered. Not everyone has the same disability and people are, as we all know, unpredictable and not always ideal companions. 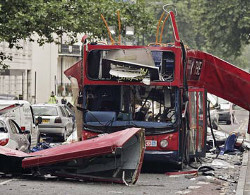 What looking back at the London bombings of 7/7 does for me is remind me how fast time flies more than anything else, although of course it was a tragedy in which so many people suffered terrible things. But it also reminds me that sometimes it takes a while before events completely play themselves out in all the ways that are likely to eventuate. I was also in 2005 recovering from my own tragedy and suffering in my own way, and this probably served to enable me to contextualise the disaster and to assimilate it more effectively than some others might have been able to. I was living at the time in a share house owned by the local area health service, although within six months I would have moved out of it into an apartment that I bought myself on money borrowed from a financial institution. The disaster I was recovering from was a complete mental breakdown in 2000 accompanied by paranoid psychosis. It was taking years to get back on my feet. I eventually got a new job back in Australia - the disaster itself happened while I was living in Japan, which only made it that much worse - in 2003, two years almost to the day before the bombings occurred. By 2005 I had settled into the job - which involved mainly HTML coding but also some technical writing - and was about to be moved from employment on a short-term contract basis to employment on a "continuing" contract basis with the same institution. It was this change that would set me off toward getting the housing loan and buying the apartment. For the moment, however, I was situated off the main road between Parramatta and Hornsby in a four-bedroom house on a quiet street surrounded by huge gum trees. The other three bedrooms in the house were occupied by young men also with mental problems and it was a sort of daily struggle to match those conditions with what I considered to be my reasonable expectations. There were arguments about tidying up the kitchen, for example, and about keeping the coffee table reasonably clean. It wasn't a lot of fun in retrospect although there was occasional camerarderie among people similarly afflicted. I even loaned the purchase price of a small family car to one of my housemates, on the understanding that it would be paid back in regular installments. I believe that it was, but I can't be sure. When the London bombings started to appear on the TV as news it was as information that dribbled in slowly, starting I think during the nightly 7pm news broadcast as a report that there had been some sort of problem in the underground train system in London. It might have been during another scheduled program that was interrupted for the purpose of transmitting breaking news, I can't remember. I only know that at first it was unclear what had happened. The full story only came out after the whole thing had been seen to by the local authorities. We gathered in the living room to watch the TV. Years previously I had arrived in Australia on a plane almost on the same day that the Twin Towers had been hit in that more famous attack. But in this new case the lack of a single, striking image made the events appear more mundane, even more prosaic. In London most of the destruction had happened in tunnels dug under the city in any case. We really only had the image of the bus with its roof ripped off to explain all the excitement the events generated in the public sphere. Stories of backpacks, of four young homegrown terrorists would only come out later. For the moment there was just the disarray of routine disaster, another attack that should have been prevented. I would have moved out of my new apartment to another one in southeast Queensland before people started thinking in detail about the ramifications of the disaster in terms of civil liberties. In 2005 the whole story had very much not played itself out completely. That would take years. It was the other day when I had opened up Skype for the first time in probably six months in order to contact my daughter in Japan. She had SMSed me asking if we could Skype so I said "yes" and went online on my desktop PC, but after trying unsuccessfully to contact her on Skype a few times I paused to wait for her to get sorted. I assumed she was just starting her PC or something similarly prosaic. Then Microsoft asked me to log in using my Microsoft email address and password, which was strange as I had never used these login details before apart from when I set up the Microsoft account, and that had been years before. The message on the screen said something about unusual account activity, which I assumed referred to the fact that I had not tried to use Skype for at least half a year, and to the fact that the initial contact attempt to my daughter had failed. So I referred to my records - it would be impossible to ask someone to keep in their working memory a password that had not been used for several years - and accessed the screen using the Microsoft login details. The screen then told me that it was going to log me out of the session and that I should login again to the PC, but this time using the Microsoft login details. In future, went the implication, my regular session login would be done using the Microsoft login details, rather than the regular password that I had always used for the purpose. I wrote down the new password on a sheet of paper next to my PC and clicked "Next". The computer shut down and restarted. I logged in successfully using the new password and then went back to Skype in order to initiate a session with my daughter and we talked for over an hour. I knew what it said. I did. It was part of a stencil on the road by the kerb saying "Look right ..." but roadworks subsequent to its application had obscured part of the word. But it's not to see things that I already know that I go for walks, rather I do it in order to see something that is new. The walk started at home and we took the Pyrmont Bridge across to Market Street where as usual there were beggars on the corners. The beggars must do a good trade because they are always there, even though I never see anyone giving them any money. Some bend at the waist with their elbows on the pavement in a real "begging" pose asking for donations. Others simply sit on bended knees on a rug on the pavement with a sign in front of them explaining their situation. There are also street sellers for the publication The Big Issue. The guy selling the magazine on the corner of Market and George today was twirling his display copy of the magazine on one finger and catching it in the same hand. This guy often gives people warning about when the traffic lights are about to change. We had lunch in a Japanese restaurant on Pitt Street where I ate udon and had some plates of sushi, as well as a packet of seaweed salad and some mame. Then we went to Muji to have a nose around. The Japanese consumer goods store sells a thousand different storage solutions from the drawing boards of Japanese designers long used to catering to a population with very little spare room in their houses. We admired their creations. My friend struck up a conversation with a coffee stall owner while I used the amenities, and when I came down the escalator to the ground floor she was paying for two small coffees. We chatted with the storeholder and her staffer and they added another shot to my friend's coffee, because she had said it wasn't strong enough. As we walked down the street afterward she complained it was too strong and asked me if I would change, even though I had been drinking my coffee for some minutes. Eventually I threw away the rest of my coffee and finished off hers. 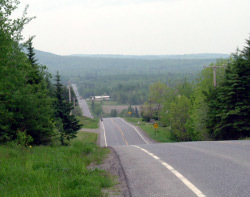 We headed toward William Street. Outside the cathedral people were walking along the reflecting pool inside huge, blue plastic balls. The balls were tethered and attendants held the ends of the tethers as the balls progressed in imperceptible degrees down the pool full of water. The sun was shining and as we passed the Ducati dealership I stopped to look in through the window lovingly. There was a young man shouting loudly and irrationally from his perch on a public seat that had discarded food and some liquid scattered around its base. He was rearranging his shoe laces. As we reached the next kerb he came up next to us and then started shouting at a motorcycle that had zoomed loudly up the street on the main road. The young man had two small backpacks but otherwise looked neat enough. He was clearly disturbed or else not in complete control of his emotions because he kept gesticulating oddly and shouting things at indeterminate objects. Halfway to the next kerb he stopped by the way and attended to nature in broad daylight. Luckily, he veered off left down toward Wooloomooloo before we reached the next kerb. I left my friend outside a cafe in Kings Cross - still a place for crazies and outcasts, for the different and displaced, despite decades of slow gentrification - and headed up Darlinghurst Road until I got to Liverpool Street, where I turned right up the hill, wanting to return home because I was tired. I passed the house that was once the first place where I ever tried marijuana, and remembered the people I knew who lived there and who had introduced me to the drug. They were also outcasts. The Frenchman had lost three fingers from his hand, in an industrial accident he told me. I always wondered. He left one day without telling me and I was desolate for a little while. The house is well presented now. There are still trees growing in its walled garden. I crossed College Street and headed into Hyde Park, walking toward the war memorial with its cream-coloured sides. The reflecting pool is bordered by evergreens and the afternoon light shone lovingly through the leaves onto the water. A few people sat alongside the pool. I headed down toward the obelisk on Elizabeth Street, to where Bathurst Street abuts the park, and crossed into the CBD again. There are some large construction sites there where companies are building residential towers. There was broken glass on the pedestrian bridge set up to accommodate construction utilities placed on the pavement for the builders to use. The corner of Bathurst Street and George Street was very busy as usual, with hundreds of people wanting to cross at the traffic lights. I headed down Bathurst Street in search of the central stairs that give access to Darling Harbour and like magic at the bottom near a heavy metal music store I found the stairs, which proved that my hunch as to their location had been exactly correct. I crossed the pedestrian bridge and descended the stairs into the throng of people with children out to enjoy the winter sun. I was almost home. I was passionate about this book even though, as you can see, I only read just less than half of it, but that reading got me up to the end of the court case saga, which was arguably the biggest event in Dobell's life aside from his birth and his decision as a young man to become a painter. In fact it was because I was so passionate about the book that I stopped reading it where I did. I have been interested in art for longer than I can credibly remember and so a book about one of the foremost figures in the history of Australian art was always going to pique my curiosity. My interest in the subject extends even to formulating my own ideas about Australian art, and even expressing them publicly. And it would therefore always be in light of such ruminations of my own that I would undertake the reading of such a book as this. It can hardly be a surprise then that I have strong ideas about this book's virtues and (what I see as) its failings. In the second category must sit a distinct lack of detail in the book about Dobell's artistic influences while he lived during those formative pre-war years in London. If it is your ambition to situate Australian painting in a global context - and why, if you love the subject, would you not want to do this? - then you would have to say that Bevan's book has failed to contextualise Dobell's influences in a global sense. It might be a lack of source material, of course, but I sense that that's not the problem. It's just that for Bevan the issue of where Australian art sits in that global context was not a pressing one while he was writing the book. And so he didn't address it adequately. In my mind Bevan is stronger in his recounting of the details of the court case, and this section of the book I think goes some way toward justifying my own ideas, as they have been explained in the link above, about Australian art in the 20th century. Dobell's main detractors Mary Edwards and Joseph Wolinski serve to illustrate for me the parochialism and conservatism of the Sydney art scene, even though there were other, very different, views of Dobell's portrait, the one which won the Archibald Prize. The mere fact that the controversy was so much discussed in Sydney, so much a part of everyday conversation, for such a long time, shows how far Australia still had to go in order to be considered a relevant art location in a global sense. Dobell, considered (as my mother told me recently when I went up to her nursing home one day) a modern, had with his relatively realist-inspired portrait dragged Australia kicking and screaming into the 20th century all at once. It was a painful process, as the book shows. I was reminded of how slow the Australian art scene was to catch up with major 20th century art movements when I saw an exhibition of Spanish art in Brisbane in 2012 which featured some European late-19th century realist paintings, which dated from the 1890s and early noughties, that resembled very closely in style the paintings from the same era of the so-called Australian Impressionists. The sad thing is that even by the time of Dobell's court case such works were still considered adequate for describing life in Australia, and this was by now the 1940s. Bevan is a quiet chronicler who respects his sources and refrains from editorialising. I found his book to be competent from the point of view of a reader of biographies generally, but there were those shortcomings: the lack of focus on Dobell's early influences in Europe, and a shyness about commenting in an overt manner on the court case and on what it said about the contemporary Australian culture industry. It is important to be truthful, if not downright blunt, about what can only be considered to be something of a national embarrassment. One product of the shortsighted and retrograde attitudes that leading figures in the culture industry of those days clung to, is the distinct lack of good representative works of European Modernism in Australian art galleries today. The works of Picasso, Matisse and Kokoschka were not bought simply because the curators and gallery managers during the years when such works were eminently affordable did not think they were important. Such hubris is astonishing. In short, they let down the country badly. I think that's the definition of a nightmare. There are too many things right now in your life that are going wrong and you just don't have the capacity to fix them all at once. It's basically what happened to me last night. I had made myself a meal of pasta - the sauce with bacon, capsicum, mushroom, onion, pepper, and soy sauce along with some cheese topping - and the people upstairs were starting to party. Then I decided at around 8.30 to call it a night. There had been enough wine drunk and there was nothing worth watching on TV. I was also a bit strung out because my son in Japan had left his workplace the night before but had not subsequently made any contact with his mother or sister, and they were worried. I have been working to enrol him in an English college in Sydney in preparation for his visit here in August and this lapse in terms of safety and probity on his part augured badly for our future peaceful relations. I had had enough and went to bed. Two hours later I woke up and the people upstairs were still going on the balcony despite it being one of the coldest nights this winter. I still haven't got used to Sydney in the cold season because I only came south from Queensland five months ago and this is my first winter here for many a year. But the big problem at this time - it was by now about 10.30pm - was my eyes. They were streaming with water from my tear ducts and they were very sore. I tried to work out what was the problem. In the throes of a slight panic that started to take hold I went to the kitchen through the dark apartment and warmed up the leftovers from the pasta meal. I put the dish on the dining table - my eyes streaming liquid all the time, my nose running with the cold, and my nerves jangling from the incessant loud thumping sound from upstairs - and sat down to eat it. I jumped up halfway through the dish and ran back to the bedroom and pulled off the sheets. They were new and I had not washed them yet and I thought that they were the culprit. After finishing the pasta I got online. I went to Twitter and quickly asked my daughter if my son had finally returned home. She confirmed that he had just returned that minute. One problem solved at least, I thought resignedly. "He is stopped," she tweeted. "Stopped?" I asked, confused. "Sorry. Stupid," she explained. I remade the bed with another set of sheets and got back in. As I lay there in the dark with the music above me thumping and my neighbours screaming into the night like a bunch of crazed loons on the balcony above my throbbing head I breathed deeply and slowly and tried methodically to work out what could be wrong with my eyes. Then it hit me: that morning when I had had light treatment for my psoriasis I had possibly not worn the goggles the dermatologist always makes sure you put on before entering the light booth. The UV treatment takes only two minutes but eyes are sensitive organs. Though I wondered why it had taken the effect of the UV a good 12 hours to make my eyes hurt. Should I go to hospital? I thought to myself. It was a Saturday night and there would no doubt be hundreds of sick people in the waiting area of the emergency department queuing up ahead of triage. Would I drive or catch a taxi? If I drove I might get a parking ticket in the morning, because surely it would take all night to see a doctor. If I got a taxi where would I catch it, on the street near the casino? I wondered. I abandoned the idea and promised myself to go to the GP first thing in the morning. As I was cogitating in this way while breathing through the pain in my eyes I slowly fell asleep and woke up again six hours later with puffy eyes but no more pain. My neighbours had turned off the music. The clean dark ruled supreme. I got up to make some coffee. Back in January I received one of those strange, uncalled-for emails that arrive out of the blue with no warning and no introduction. It was an email from someone I had never heard from and it was about something that I had not thought about for some 35 years. Someone had found my first typewriter, it transpired, in fact the machine that I learned to type on back in the 70s. "I think I may have stumbled across something that belongs to you," he wrote. "I bought a Lemaire Deluxe 800T from the Anglicare bookstore and upon doing an office rearrange have found your name inscribed on the back." Sure enough along with the front view photo that you can see here on this blogpost there was a photo of the metal label on the back of the typewriter with my name inscribed on it. I probably used the point of a mathematical instrument like a compass - we used such things in those days before the advent of the PC - to carve my name in the soft metal of the label. I did answer that email promptly on the same day I received the email. In my response I talked about some of the history of the machine, which was bought in the mid-70s as far as I remember, but that's hardly accurate, it was such a long time ago. "I remember I think in 5th form (Year 11 nowadays) when I was sick for an extended period of time, I used to use an open book to learn how to type," I wrote to my correspondent. "I just copied the book onto page after page of typescript." And it's true. 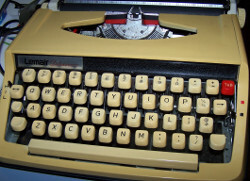 That's how I learned how to type, just by copying page after page from novels onto pieces of A4 paper using this typewriter. 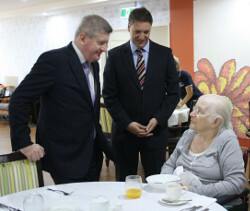 When I hear politicians saying that they are going to provide more services to help elderly Australians stay in their homes longer, I wonder if they ever think about the families who will be the ones who will provide the main support for those older people still living in the community. In my experience, having spent the best part of the past six years caring for my elderly mother, it is always the families who are asked to do more. These thoughts came to me when I was reading a list of dos and donts to keep in mind when dealing with elderly people living with dementia. 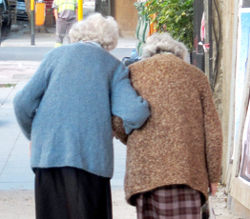 It's fine to ask those closest to the elderly to change the way they perform their caring tasks, I thought, but who is there to support the carers? Does the government ever think of the carers and the families who will be doing the most of the worrying about elderly people living in the community as though nothing were physically wrong with them? Personally I think the government just wants to keep people out of residential aged care facilities because it is cheaper to do that than pay for them to be looked after by professionals. And the people who will have to do more to take up the slack under such a regime are the family members. I had reason to laugh out loud recently though when listening to one bright idea that was aired through the news. Apparently someone wants to match up young people with elderly Australians so that in exchange for services and a token rent the young lodger can get cheap accommodation in the house of some asset-rich older person. I wonder if the people who though up this ridiculous idea even thought for a moment about how the families of those elderly people think about this kind of mooted arrangement? What about succession planning? Who is going to protect the legitimate interests of children in the years when adults are at their most vulnerable? It seems that everyone has a good idea where the elderly are concerned, but for my money what counts most is the way that everyone involved is treated. Merely asking families to take on more of the burden of looking after elderly people is just selfish, and punishes those - the so-called sandwich generation - who anyway have plenty of other things in their lives to worry about. Never mind that they are resourceful, clever, educated and wise. They are also human and they need help themselves from time to time. I get fed up with people giving advice about things that they know nothing about. I wonder if the responsible minister in the federal government has ever had to look after an elderly parent. I doubt it.